Traveling has always been a favorite activity. When I was younger, I loved our family getaways (and still do!) and now as an adult, ‘travel’ is a definite budget line item goal so I can afford to plan my own trips and choose new destinations. I love exploring new locations, learning new cultures (even those local cultures in the U.S.! ), trying new activities and simply getting away from life’s daily responsibilities and grind. There are many factors that help make a trip memorable, fun and smooth. I truly believe that the people you travel with are the greatest factors in a successful trip. Finding someone/some people who are flexible, easy going and can ‘go with the flow’ if snafus happen can make or break a trip. I recall one of my backpacking trips to South Manitou Island with a group of friends – we woke one morning to thunderstorms and hard rain. Three of us girls piled into a tent and spent a few hours sharing stories, laughing, braiding hair and basically making the most of the unplanned event. When the storms cleared, the planned hikes and fun resumed but it was awesome to be with people who shrugged at the circumstance and moved on. Traveling solo can be fun too. You can set your own plans and pace, and either do as much or as little as you want without worrying about keeping everyone happy. 1. Be prepared to spend some time doing research. Whether it was Maui, Ireland, Alaska or somewhere in Michigan, I took the time to check out local websites and read reviews. This up front research helped me know some local spots, things to be cautious about, and feel a bit more comfortable with a new area. This was especially important when I went to Ireland, as despite it being an English-speaking country, it was still a foreign country with different cultures, currency and customs. 2. Check out the homes, cottages and condos available on rental sites, such as Vacation Rental By Owner (VRBO.com), Air BnB, HomeAway.com and others. I found the awesome oceanfront Maui condo on VRBO, thanks to the suggestion of a friend. These options can sometimes be more affordable, spacious and cozier than a standard hotel (I especially like having the option of buying your own food and making meals when you want). Some questions to consider: When were the pictures taken? If there’s a kitchen, what’s included (dishes, coffee, detergent, etc.)? Are laundry facilities available? Is there a local person to contact if something happens? Is there a cleaning fee and other fees not included in the listed nightly fee? 3. Read reviews. I like to find a potential facility on TripAdvisor to get some feedback. VRBO usually also has guest reviews of each facility. Keep in mind that these reviews are subjective (what one person finds lacking may not be a big deal to another). However, if consistent problems or concerns are listed, it might be time to look at another facility. For example, my family was ready to book a location for our summer trip until we skimmed the reviews and noticed a lot of recent complaints about cleanliness and cranky staff. We moved on. Check dates of the reviews to ensure the concerns aren’t from years ago. If you want to pay it forward, write a review after your trip of the lodging, entertainment venue or restaurants you experienced during your trip. 4. Look for a Groupon or other discounts in the local area for lodging, meals and entertainment. If you’re looking for local ideas at your destination, search Groupon, Living Social or similar online discount sites for discounted tickets, restaurant and activity coupons. There are a lot of great choices. You may find a food spot or activity that you wouldn’t have known about without searching. Exploring Alaska, one of my favorite trips. 5. Cash in credit card or airline miles. Many people don’t know that these earned miles aren’t just for airline tickets. Most of the time you can redeem for car rentals, restaurant gift cards, cameras, hotel rooms and more. Make sure you know the redemption rules to check on blackout dates and fees. 6. Ask for input from friends and family. A plus of social media is the ability to share your personal business with a large group of people at once. Heck, often times, friends of friends can learn your business with the click of a button. Take advantage of this by asking for input, suggestions and reviews on Facebook, Twitter and other sites. 7. Be flexible. If you can adjust dates and also be flexible in the type of lodging or car you reserve, you may find a better deal. Also, once you arrive at your destination, be flexible in your activities if possible. I like to have some ideas for activities but try not to set too much in stone so I can be ready to try something new if the opportunity arises. When my friend and I went to Riviera Maya, we had zero plans except relaxing at the resort. However, I woke one morning and decided to hike the ruins. It was fun! 8. Check out Costco or other member companies. While I haven’t personally used Costco to book travel, several friends regularly book rental cars, hotels and more through the big store and assure me that they receive great discounts. 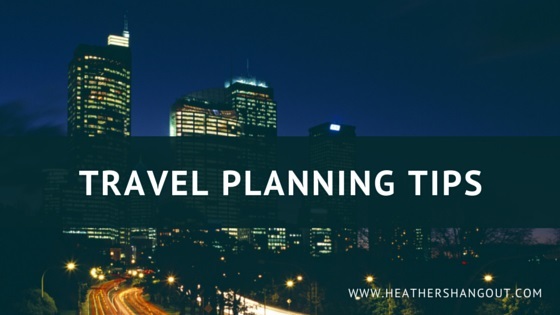 If you put a little time into the planning portion of your trip, you can relax and have fun on the actual trip. And the golden rule of travel for me is to take life in stride – you’re on vacation, enjoy it! And don’t forget to take pictures! What tips do you have for trip planning?